Articled/ Practical Training is the core to CA Curriculum and is its back bone. The Principal of Articled Trainee is the most important GURU/ Teacher for a CA student. Apart from academics, as the Principal, he imparts practical training on various areas such as auditing, law, accounting, management and so on. He teaches inter personal skills, guides for career growth and grooms articles to be an all rounded professional. The articled training is probably the only phase where a student has the same teacher for 3 years! The Principal – Article student is often known as a bond is for life – it transforms life’s and careers of budding Chartered Accountants. तस्मै श्रीगुरवे नमः ॥ Guruur Brahmaa Guruur Vishnuh Guruur devo Maheshvarah। Guruus Saakshaat Parabrahma Tasmai Shrii Gurave Namah॥ Guru is truly, the representative of Brahma, Vishnu and Maheshwarah. He creates, sustains knowledge and destroys the weeds of ignorance. I salute such a Guru. Sarva Sruti Shiroratna Viraajita Padambujaha Vedaantaambuja Sooryo Yah Tasmai Sri Gurave Namaha. That Guru who is the ocean of the Srutis (Vedas), the Sun of knowledge (who can destroy our ignorance with these rays), I salute such a Guru. A teacher is like a potter who gives a perfect shape to his student. 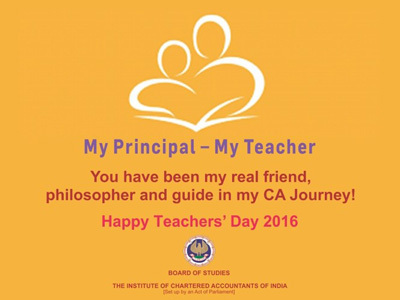 The important role played by the Principal is very well appreciated by the Chartered Accountants and aspiring CA Students. 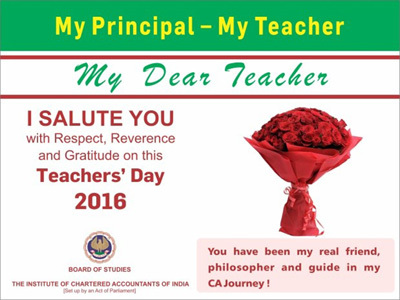 The Institute proposes to celebrate the great occasion of Teachers’ Day on September 5, 2016 to strengthen the relationship and bond between Articles and their Principal and also to ensure that Chartered Accountants pay respect due to their Principal. The objective is to strengthen the lifetime bond that has been fostered over the three years period of Article Training. As we all appreciate, once a student greets his Principal as his Teacher, the Principal will in turn ensure that his Students learns the work very well, learns values and quality of article training shall improve. Achieving the Teacher status automatically changes the behavior, attitude and attention that we give to our students. Every Principal envies to be in that position. We all need to give, acknowledge and reserve the teacher status for our Principal - it is noble and every Principal is genuinely a teacher. On this Teachers Day, all Students shall to connect with our Principal and all CAs shall connect back to their Principals. This shall be our resolve and earnest endeavor. 3. SMS Quotes and e-Cards to felicitate Teacher/ Principal The best way a शिष्य/ Student can pay his/ her guru/ Principal the gurudakshina (गुरु दक्षिना) for helping them to achieve their goal is to remember, respectfully appreciate and felicitating him/ her on this day. To enable the Chartered Accountants and Students to express their gratitude towards their Principals, e-cards and SMS quotes are made available at the end of this announcement. 4. 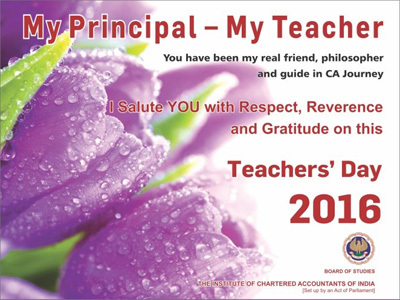 Teachers Day Programmes at Regional/ Branch Offices of the Institute and at Offices of Chartered Accountants The event is also being celebrated across the country at our Regional Councils and Branches and also at CA Firms. Students are requested to join these programmes. I request all Chartered Accountants and CA Students to actively participate in aforementioned initiatives of the Institute to strengthen the bond, affiliation and goodwill for the profession to grow by leaps and bounds. सिर्फ किताबी ज्ञान नहीं, जीवन जीना सिखाते हैं आप. 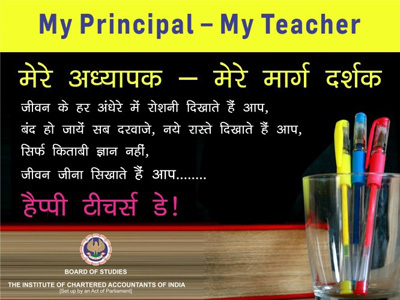 हैप्पी टीचर्स डे २०१६ ..
My Principal – My Teacher, you have given an ambition to my life. 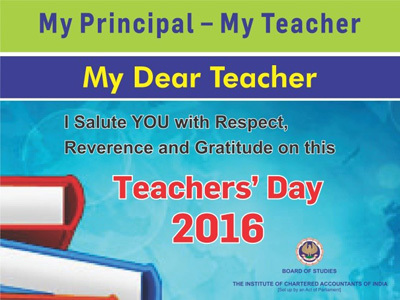 You are my mentor, my inspirer.......Thank You.....Happy Teachers’ Day 2016!!! My Dear Principal your vision is my mission. Many Thanks for your continued support....Happy Teachers’ Day!!! When I sit back and think, I realize the life would not be so bright without you My Principal. Thanks for being with me.... Happy Teachers’ Day!!! Your flame has set ablaze fire in me which will definitely bring the best out of me.... Happy Teachers’ Day!!! 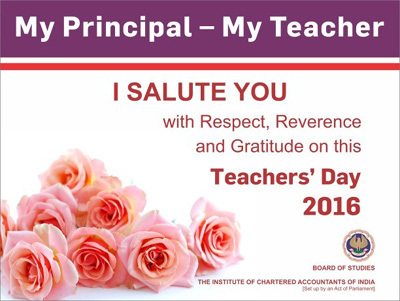 A day to celebrate for both of us....I want to pay my sincere respect to you my dear teacher- my principal for all your efforts... Happy Teachers’ Day!!! My dear principal you are much more than a teacher to me. You have always inspired me...you are my mentor... Happy Teachers’ Day!! !